A carte-de-visite portrait of Léopold II (1835-1909), King of the Belgians (reigned 1865-1909). 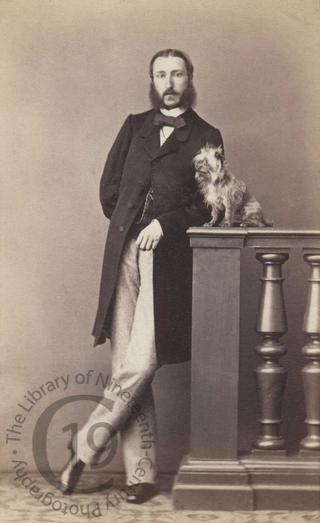 He is seen here posing with a small dog, presumably the same family pet that appears with his young son in a portrait by Ghémar Frères. Throughout his life, Leopold’s main interest was in African exploration and colonisation. It was as a result of the expeditions that he inaugurated – he commissioned Stanley to explore the Congo river basin in 1867 – that the European 'scramble for Africa' began. At the Berlin Africa Congress (1884-1885) an area was recognised as the Congo Free State and Leopold's personal possession. Leopold thus 'owned' the Congo in his own right. Using forced labour, he amassed a vast personal fortune from the trade in raw rubber, which he lavished on building projects in Brussels, on real estate in the South of France, and, in his dotage, on his mistress, Caroline Delacroix. Sixteen years old and working as a prostitute when the sixty-five year old king first met her in Paris, she came to be hated by the Belgian people, which didn't stop Leopold marrying her on his deathbed. Under Leopold's rule the Congolese were exploited with a barbarity that shocked the world, even in those days of colonial oppression. He was widely regarded as the most brutal monarch of the nineteenth century, not only by the general public, but even by other royal families. After he had made a visit to Berlin, the Prussian Empress Augusta had the palace rooms that Leopold had occupied exorcized by her personal chaplain. Photographed by François Deron of Brussels.